Warmup’s wafer thin undercarpet heater fits between the carpet and underlay. If it wasn’t for the lovely warm feeling in the room, you would never know it had been fitted. Our undercarpet heaters are foil based, ensuring even heat distribution. Thanks to the technology, they are 100% waterproof, further acting as an earth shield over the internal core wire. Built with spring like flexibility, the core wire is a durable cushion that can withstand heavy furniture, snooker tables, stiletto heels and other household items, provided installation is done correctly. Warmup’s undercarpet heating pads can be used beneath almost all types of carpeting. Warmup’s heating pads are a result of more than three decades of advanced research and development. The undercarpet heating pads are designed never to overheat and can be left on continuously. A good quality underlay is essential. Warmup recommends a standard 1000 - 1200 gram underfelt, as well as the Belgotex Orange Underlay. To ensure you enjoy the full lifespan of the heating system, the subfloor must be smooth and level, and free of all stones and grit. Warmup undercarpet heaters are safety tested and are completely waterproof. It is encased in a tough "earth shield" which withstands heavy traffic and eliminates the risk of electric shock. Warmup components have the benefit of over 30 years of European technology for applications that demand high flexibility, continuous operation at high temperatures and long working life. Discreetly hidden from view, this wafer thin heater lies hidden between the carpet and underlay. There are no visible elements or radiators. No summertime storage problems. Under any modern polypropylene or hessian backed woven carpet, as well as under coir or sisal carpets. Cannot be used under rubber or foam carpets, or stick-down carpet tiles. While Warmup heaters have been designed to never overheat - and may be left on continuously - timers and thermostats are available as optional extras for additional control. Quickly installed under new or existing carpets by any competent carpet fitter, or DIY installations under loose rugs. A good quality acrylic underlay will prevent downward heat loss, a minimum of 1000gsm should be used. Belgotex Orange Underlay, is also compatible. 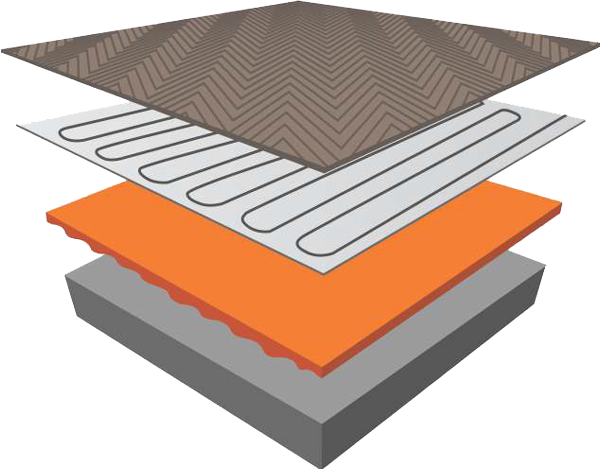 This is not in-screed heating, and is effective within 30-60 minutes of switch-on. You heat the area you need, when you need it. A 5 year factory backed warranty is provided. Warranty forms are issued with each heater, which include important instructions on the correct way to use the heating system. For ultimate control and maximum energy efficiency, we recommend the use of an intelligent Warmup thermostat.